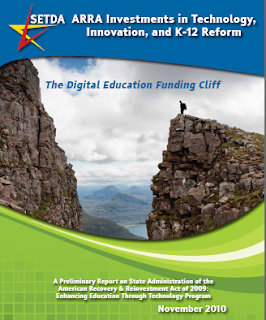 "ARRA Investments in Technology, Innovation, and K-12 Reform: The Digital Education Funding Cliff," a report released at the State Educational Technology Directors Association (SETDA) 2010 Leadership Summit and Education Forum earlier this month, illustrates that with appropriate funding and leadership, states and districts can make positive differences for students. The report, which is the first and only of its kind, offers a preliminary snapshot of how states and school districts are using funds from the Enhancing Education Through Technology (EETT) Program under the American Recovery & Reinvestment Act (ARRA) of 2009. The result is an explosion of innovation with regard to digital and open content, online assessment, online and blended learning, increasing student and teacher access to a wide and growing array of computing devices — allowing for more choices and personalization — and even increased access to powerful data and information on student learning. Coupled with the release of the National Education Technology Plan at the SETDA event by U.S. Secretary of Education Arne Duncan and the release earlier this year of the FCC’s National Broadband Plan, which included within it an ambitious education agenda, the work states and districts are completing with the ARRA funding continues a strong momentum toward increasing education effectiveness and efficiency through technology. About the State Educational Technology Directors Association (SETDA). Founded in 2001, SETDA is the national member association that represents the interests of the educational technology leadership of state and territorial education agencies in all 50 states, the District of Columbia and the Bureau of Indian Affairs. SETDA members work collectively and in public-private partnerships to ensure that meaningful technology innovations with broad potential for systemic improvements and cost-savings in teaching, learning and leadership are brought to scale. For more information, please visit www.setda.org. What Really Puts Your Students At Risk Online?